Edge is the new and default browser in Windows which supports extensions and many other useful features. By default, when you close Edge browser with multiple tabs, it will show a confirmation box asking "Do you want to close all tabs?" This confirmation dialog gives you a chance to review opened tabs before closing the Edge browser. However, if you don't want to see this prompt every time you close Edge, you can disable it by selecting "Always close all tabs" option. When you select this option, Edge will terminate all tabs without any prompt when you click on the close button. The best thing about this option is that it allows you to close Edge quickly. The problem is, once you disable the prompt, there is no option in Edge settings to re-enable it. That doesn't mean you cannot enable "Do you want to close all tabs?" prompt. Here's how to enable it within a few seconds. You can enable Do you want to close all tabs? prompt in Edge by adding or changing a single registry key. Before proceeding to edit, backup registry, just to be safe. 1. To open Windows Registry, open start menu, type "regedit." Now, right-click on it and select "Run as administrator." This will open Windows Registry with admin privileges. 2. The key we are looking for is buried pretty deep within the Registry Editor. So, simply copy the below path, paste it into the address bar and press Enter. You will be automatically taken to the required key in an instant. 3. 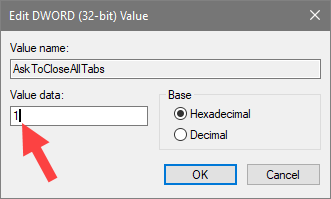 Here, right-click in the empty space and select "New -> DWORD (32-bit) Value." Name the DWORD value as "AskToCloseAllTabs". Note: If you already have AskToCloseAllTabs value, there is no need to create another one. Proceed to next step. 4. Double-click on the AskToCloseAllTabs value, enter "1" in the Value Data field and click on the "Ok" button save changes. Now, restart or sign out and sign in to make the changes take effect. Sometimes, restarting Edge browser would suffice too. After restarting, whenever you are trying to close Edge with multiple tabs, you will get "Do you want to close all tabs?" prompt. This gives you the change to review the tab before closing Edge browser. Hope that helps. Share your thoughts and experiences about using the above method to enable "Do you want to close all tabs?" prompt in Edge.